This Spider-Man Go Glow Pal has special light up eyes for protection in the dark and suckers on his hands which stick to smooth surfaces! Press his tummy and watch his eyes light up! Batteries included…. 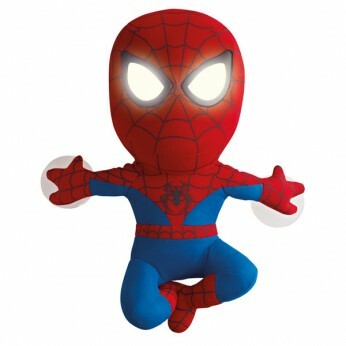 This cuddly Spider-Man toy softly glows as a night light for fun and reassurance when safely tucked up at bedtime. He has special light-up eyes for protection in the dark and suckers on his hands to scale any surface! Children just have to squeeze their pals hand to activate the night light and as they drift off to sleep the light will go off after 15 minutes. Gently press his tummy and watch his eyes light up as a reassuring and fun night time friend. Auto shut off after 15 minutes; Use the suckers on his hands to stick him onto your head board, window or other smooth surfaces so he can be a friend to play with during both night and day! One supplied; Batteries required: 3 x AA (included); Suitable from birth; For ages 3 years and over; EAN: 5013138639252. WARNING(S): Not suitable for children under 3 years old. This toy costs approximately £18.50 (for the latest and best prices make sure you check our retailer list for the Spider-Man Go Glow Pal above). In our review of Spider-Man Go Glow Pal we classed it as being suitable for ages 3 years, 4 years, 5 years but recommend you check the manufacturer specific advice before purchasing.